Bryan Singer resurrects the sacred Superman franchise with this offering and I have to say that it fell short of my expectations on many levels. If you don't mind spoilers, read on; if you do, be warned that this review contains some. First of all, the way this film is shot relies far too heavily on computer imagery. One of the things that made the Reeve films so special was that they looked realistic, as if a guy could actually fly. This? No way. Second, the characters of Lex Luthor and Lois Lane were left wanting for me. I loved Gene Hackman's portrayal of a sarcastic, bumbling yet ambitious Luther in the first series. In fact, I thought he was often hilarious. Here, though, Kevin Spacey doesn't play Lex Luthor as much as I suspect that he just plays Kevin Spacey, who has always reminded me of the kind of guy you'd find hanging around a highway rest stop (and that's even before the rumours). And no Ned Beatty or Valerie Perrine's Miss Tessmacher to provide Luthor's sidekick, but just Parker Posey doing what she always does best - annoy. Kid: "Is Superman gonna be OK?" Lois: "I like him, too." Cue the violins. I mean, come on. This is the Man of Steel, dammit, not Jerry Maguire! Little kids aren't supposed to "like" him. They're supposed to be in complete, speechless awe of him. And what's with the scene when he goes flying by Lois' house and pulls a Peeping Tom? Kinda chumpy, if you ask me. Finally, the situations where Superman saves people are not as spine-tingling as I would have hoped. No kids falling into Niagara Falls, helicopters falling off the top of skyscrapers, or malfunctioning Eiffel Tower elevators (damn terrorists). Instead, we get a botched 777/space shuttle combination take-off. Huh? Whatever the opposite phrase of "my hair was standing on end" is, well, that was me. It's not all bad. The guy who plays Lois' new beau is a decent actor. There's also respect shown to the first series, from Superman talking about the safety of air travel, statistically speaking of course; Clark's use of the word "swell"; Superman showing up when Lois is on a balcony and saying "I didn't mean to startle you" and his patented "Goodnight, Lois" when he drops her off; and finally, his commenting on Lois' smoking. 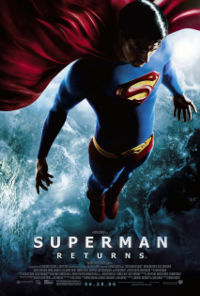 For his part, Brandon Routh does well with what he has to work with, namely, a mediocre script. I am biased because I thought the first two movies of the Reeve era were incredible, and I still do. I also never watched Smallville, The Adventures of Lois and Clark or any of those shows so I don't have any frame of reference for any other portrayals of the characters except for the ones from back then. Go if you have to, but otherwise, I'd skip it. Overall rating: Meh ... an ambivalent 6/10. I think even Superman III was better than this one. Leave super heroes out of the art house. Like your politics, you got this one wrong.